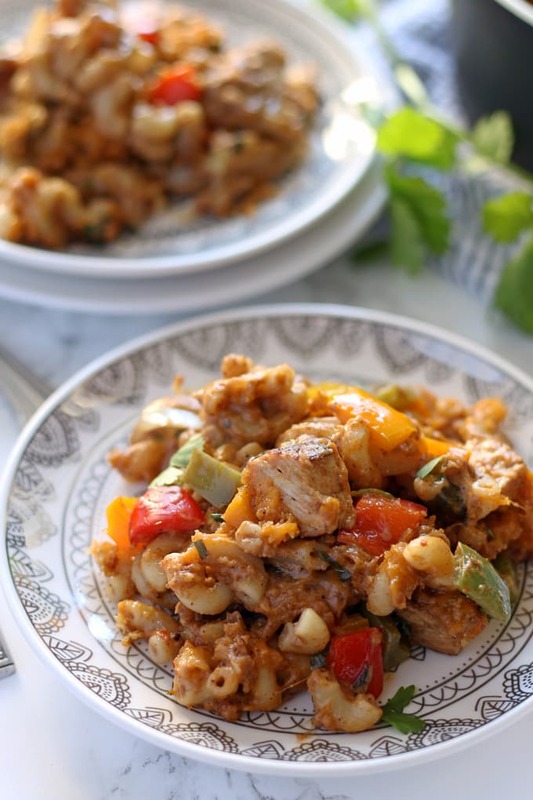 This chicken fajita mac and cheese is some serious comfort food. It is perfect for Sunday supper so invite your whole family over for dinner! This winter hasn’t been that cold and usually we would take advantage of the moderate temperatures and do some serious outdoor winter grilling. Alas, an important part of our grill cracked in half in the fall and we haven’t had it fixed yet. Luckily, I have two ways to do some indoor grilling and I’ve been taking advantage of them both. I also use this amazing Calphalon non-stick grill pan. We were given this as an add-on when we purchased our pots and pans when we got married. I laughed and was all like, “Yeah, like we’re going to use that.” Now I laugh because I can’t imagine not having it in my kitchen arsenal. I focus on easy recipes almost all of the time. 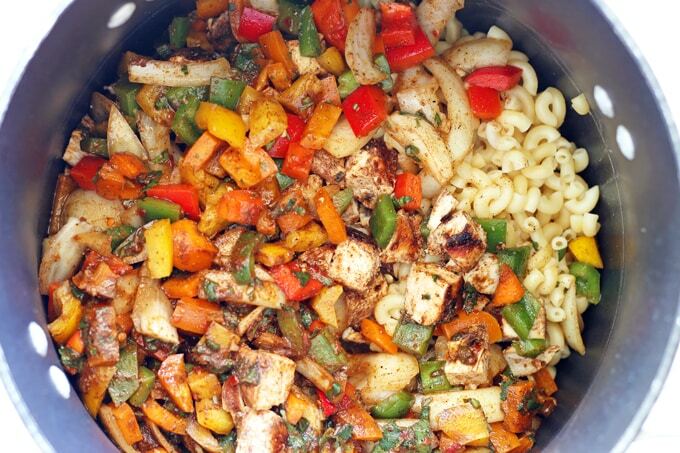 Occasionaly, however, I want a serious meal and this chicken fajita mac and cheese is just such a dish. It’s got Sunday Supper written all over it. The ingredient list is long, and may be intimidating. Most of it is just the marinade for the chicken though – you really want that fajita flavor and the cheese works hard to hide it. I am obsessed with this recipe now because it’s so delicious and worth all the time it takes to make it. In a smal bowl combine the ingredients for the marinade: lime juice, vegetable oil, Worcestershire sauce, 1 tablespoon ground cumin, 1 tablespoon chili powder, 1 tablespoon fresh chopped cilantro, minced garlic,1 teaspoon brown sugar, 1/2 teaspoon smoked paprika, 1/2 teaspoon kosher salt, 1/2 teaspoon black pepper, 1/2 teaspoon cayenne pepper, 1/4 teaspoon red pepper flakes. In a large bowl combine the bell peppers and yellow onion. Pour 3/4 of the marinade over the vegetables and toss. Place the chicken breast in the small bowl with the remaining marinade and coat the chicken in the marinade. Cover both bowls with plastic wrap and refrigerate for at least 2 hours. When the chicken and vegetables are done marinating, grill the chicken until it reaches an internal temperature of 165 degrees. Remove from the grill and allow to rest. Pre-heat oven to 400 degrees. Begin cooking the pasta according to the package directions. 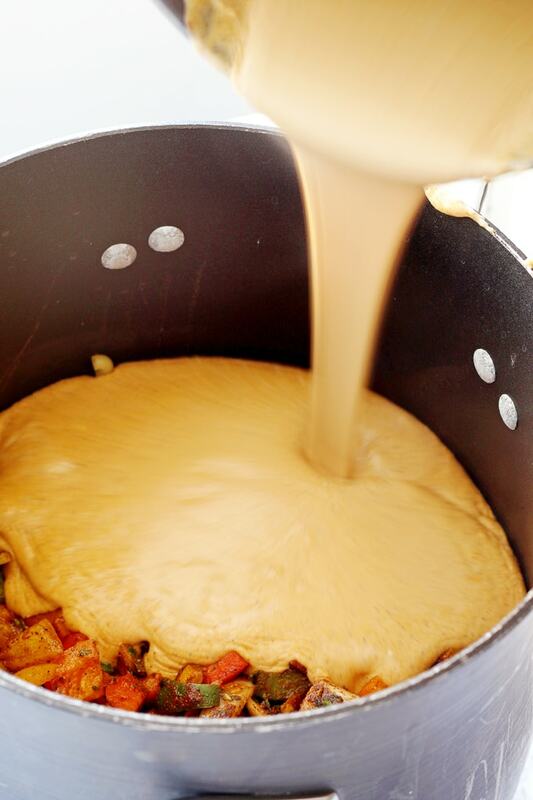 While the pasta is cooking, prepare the cheese sauce. Melt 4 tablespoons of butter in a large saucepan over medium heat. Stir in the flour until smooth, then gradually add the milk. Increase temperature to medium high and bring to a boil. Cook and stir for 2 minutes. Reduce the heat to medium. Add the cream cheese, 8 ounces cheddar cheese, 1 tablespoon cumin, 1 tablespoon chili powder, 1/2 tablespoon paprika, 1/2 teaspoon kosher salt, 1/2 teaspoon black pepper, 1/2 teaspoon cayenne pepper, 1/4 teaspoon red pepper flakes. Stir until cheese is melted and the sauce is smooth. Drain the macaroni noodles. Dice the chicken into 1-inch pieces. 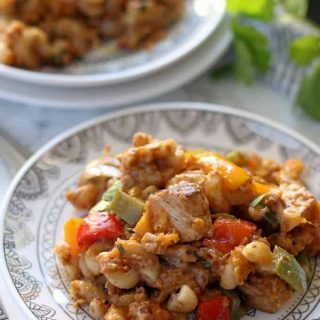 Combine the cooked macaroni, cheese sauce, chicken and marinated vegetables and stir until everything is evenly coated. Transfer to a large baking dish. Sprinkle the remaining shredded cheese on top of the macaroni mixture. In a small bowl melt the remaining butter. 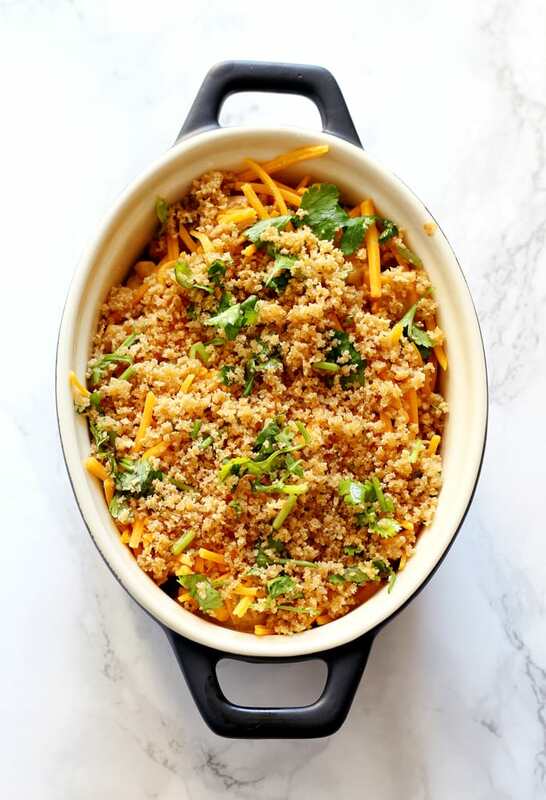 Toss with the panko bread crumbs and the cilantro and sprinkle over the cheddar cheese. Bake uncovered 15-20 minutes, or until the top is golden brown. 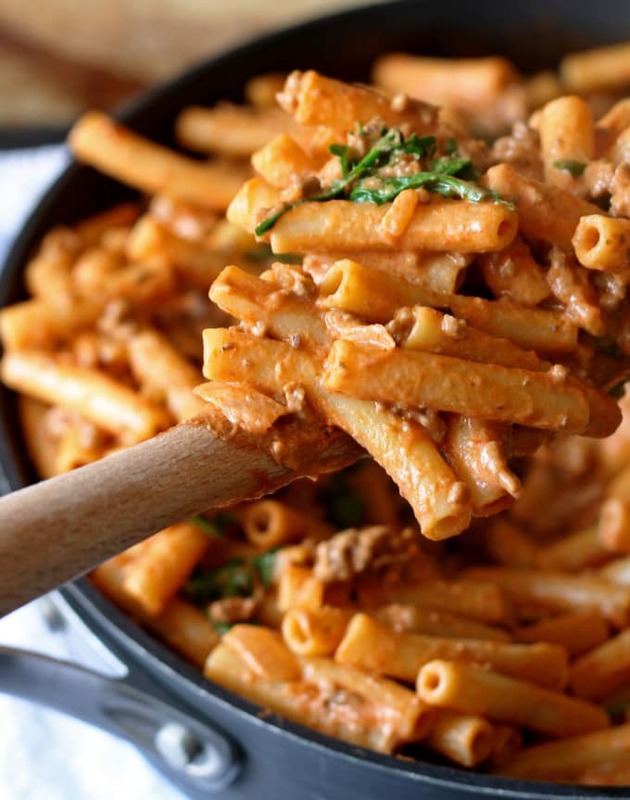 Looking for more pasta dinners? 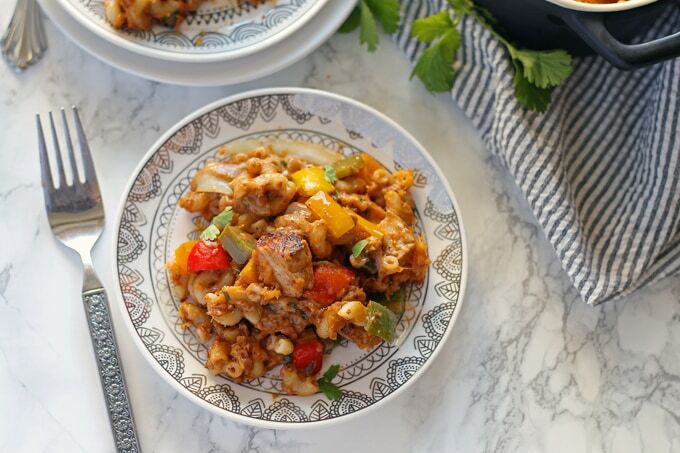 Try this one pot spicy sausage skillet! My mind is seriously blowing right now. This is genius, and I’ll definitely be trying it soon! Looks AHHHHHHHmazing! You know exactly how to do mac ‘n cheese. Dayyyum! That’s the kind of mac ‘n cheese I wanna roll with! Sounds so, so good!! This is exactly the kind of meal I want to come home to after a long hard day! Looks and sounds delicious! I love this jazzed up mac and cheese. It’s mac and cheese but so much more too. What a hearty meal – Pinning to make soon! OMG! This makes me hungry! I love everything about this mac and cheese! 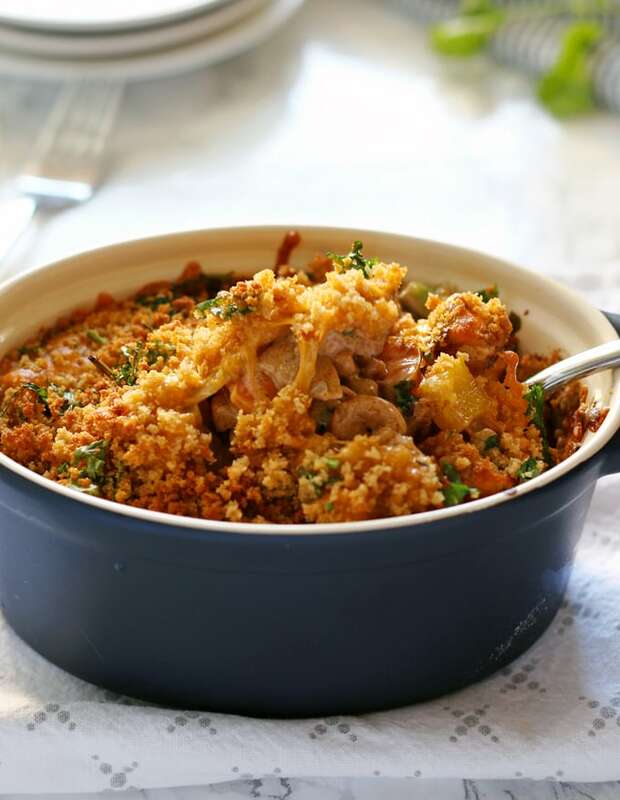 I love a good pasta bake and this is a zesty twist! Thanks for sharing on the Creative K Kids Tasty Tuesdays party. I hope you will join us again next week. Yum! I love how different this is! This looks INCREDIBLE!! I am just drooling looking at the pictures! Absolutely love it Jenny 🙂 Pinning and Sharing!! This looks sooooo tempting right about now!! I need this in my life for real. You’ll be featured at tonight’s Throwback Thursday link party, we hope to see you there!! This is what my mom would have called, “a stick to your ribs meal.” I’m looking forward to trying it and I know my family will love it! Thanks for linking up and sharing this delicious Chicken Fajita recipe with us at #overthemoon. It looks so tasty and a family favourite. Why haven’t I thought of this. 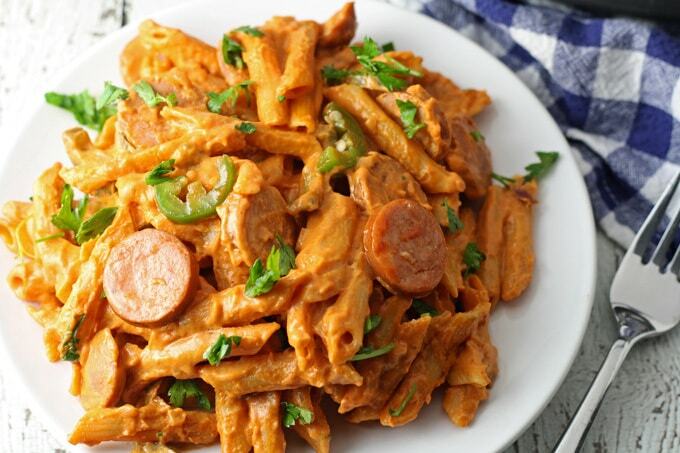 Wonderful recipe that my whole family will eat and enjoy. Found you on the Bloggers Spotlight.